There was a similar question to this on Stack Overflow regarding Xcode 5, however, the solution no longer works. I would like to change my IBeam cursor in Xcode to use this cursor instead. Run ThemeEngine in Xcode and you may be presented with a few errors. Failed to code sign "ThemeEngine". Nullability specifier '_Nonnull' cannot be applied to non-pointer type 'NSString'; did you mean to apply the specifier to the pointer? Once loaded, find DVTIbeamCursor in the list and drag your IBeam of choice over Xcode's default Ibeam. 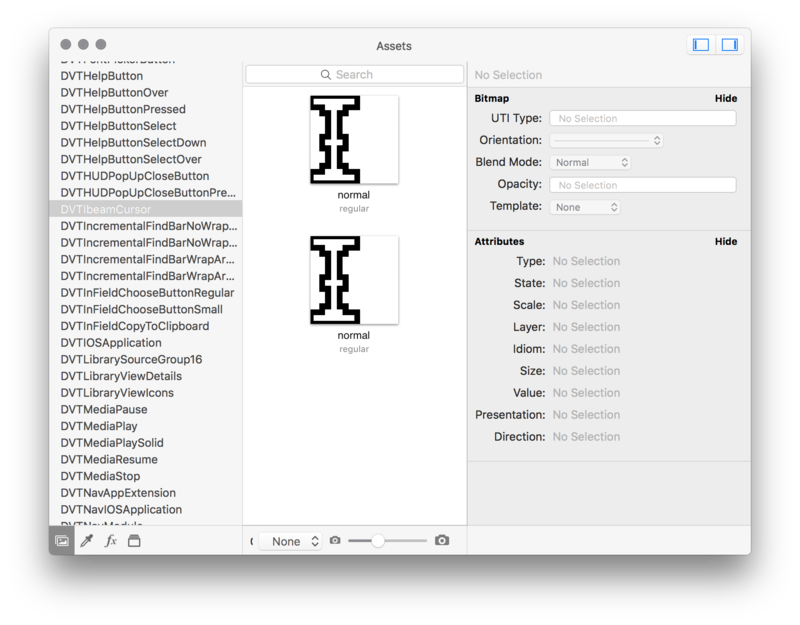 Select "Save As..." and overwrite Xcode's Assets.car file with the new file. I had to save the copy to my desktop and then drag the new Assets.car file into the Xcode folder to overwrite. Not the answer you're looking for? Browse other questions tagged macos xcode cursor . Cannot change font size in Xcode 4? IDERepositoryViewer damaged or missing resources causes Xcode 5 to crash. Why? How to disable Xcode's '“ProjectName” is a project downloaded from the Internet. Are you sure you want to open it?' dialog? Unable to clear Xcode from Trash. Force clear in Terminal returns permission error?